Edward Leamington Nichols (14 September 1854 – November 10, 1937) was an American physicist. He was born of American parentage at Leamington, England, and received his education at Cornell University, graduating in 1875. 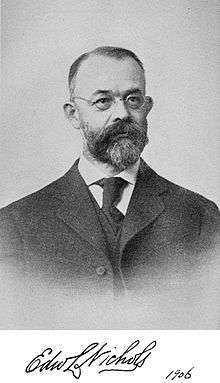 After Studying at Leipzig, Berlin, and Göttingen (Ph.D., 1879) he was appointed fellow in physics at Johns Hopkins. He then spent some time in the Thomas Edison laboratory at Menlo Park, N. J., and subsequently became professor of physics and chemistry in the Central University of Kentucky (1881), professor of physics and astronomy at the University of Kansas (1883), and professor of physics at Cornell University (1887). He was elected a member of the National Academy of Sciences, was president of the American Association for the Advancement of Science (1907) and of the American Physical Society (1907–08), and served as a member of the visiting committee of the United States Bureau of Standards. The degrees of LL.D. and Sc.D. were conferred on Professor Nichols by the University of Pennsylvania and Dartmouth College respectively. He was the author of several college textbooks on physics. In 1927 he was awarded the Franklin Institute's Elliott Cresson Medal. In 1929 he was awarded the Frederic Ives Medal by the OSA. He was adviser of numerous outstanding scientists in Cornell University including Ernest Nichols, and Arthur Foley. His PhD adviser was Johann Benedict Listing  in Georg-August-Universität Göttingen. ↑ "Mathematics Genealogy Project (Edward Leamington Nichols)". ↑ "Mathematics Genealogy Project (Johann Benedict Listing)". Ernest Merritt, Edward Leamington Nichols Physical Review, 53, 1 (1938).